^ Nice color combo. Particularly the wheels. Nice list of mods. No aftermarket air filter? edit: could you tell the difference in the handling of the bike when you got your Marchesinis? jb,just go ahead in lower your bike. you will feel so much more comfortable. i lowered my cbr and am loving it. its true about the whole kickstand thing. can adjust my height from stock to four inches. check out there website sometime. by the way im not sure how much mine is lowered,but i can put both feet flat and im 5'6 havent really noticed any difference in handling. ^ Thanks for the info. At this point I've pretty much decided to lower it. Hoping to get to the dealer this week so I can enjoy the bike Memorial Weekend. If not I can still ride it, and I'll get in next week. Soupy's lowering link. It's adjustable from stock to 4 inches down. I dropped mines about 1.5 inches. And to the bike. I like the color combo as well. being a fan of white, I would have gone all white, have the lettering at the bottom in black, and keep the gold wheels. 85 Honda 500 Interceptor, 52K miles, stock except for Progressive Suspension Springs and 20W/30W shock fluids. First bike, bought it new, easy to ride up to 8/10. Maybe a 2007 CBR1000RR in the future. My avatar is the motor upper crankcase when I rebuilt it. Nice bikes but they like to eat cams and followers. I'm lovin' the old Interceptor! Sweet endo!! Unfortunately I did not get to ride this weekend. Had company from out of town and was busy running around... then spent a day up at the lake at a friend's lake house. There was four of us on those three bikes. Unfortunately I did not get to ride this weekend. I took MSF last July, got this bike - Vulcan 800 - in March and have been very addicted to riding ever since. I had to ride it today even with a threat of storms. I had to ride it today even with a threat of storms. Riding with a threat of storms is normal. If I didn't I would never be able to ride. My rule is if I walk outside and its raining then I take the car, other than that the bike is acceptable. I have an appointment with the dealer next week to do an oil change and check the fluid levels, etc. No one makes lowering links for my bike, but they said they can likely adjust the ride height a little bit by just adjusting the stock shock. If they can get half an inch I'll be golden. If not, no biggie b/c I am getting used to the height. Well, took the bike on the Interstate for the first time today. That was fun. One thing I realized is that I need a windscreen if I plan on going on longer highway trips. Wind was brutal at 75 mph. I could have told you that.......oh wait....I did. ^ Yeah, I knew I needed one as I already mentioned buying one... but today just confirmed it. Too bad they do not make the Double Bubble screen for my bike... I like that screen. I came over to the motorcycle world just a couple weeks ago. I completed basic rider course and just purchased my first bike last friday. 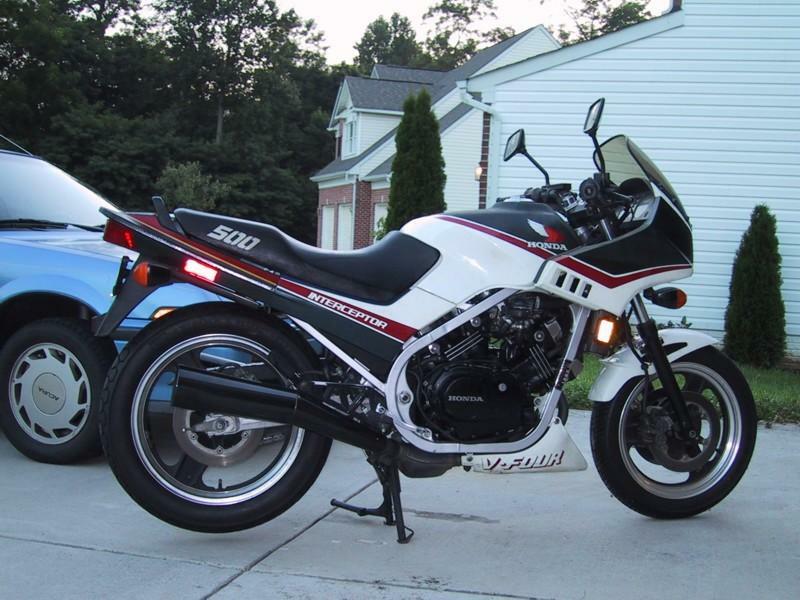 I bought an '06 Suzuki Katana 600 with 900 miles on it. I went to the dealer to look at an '02 Triumph Sprint RS w/ 12k miles, but walked out with the Katana. $3600 OTD seemed to good to pass up. I put on a couple hundred miles this weekend and can't wait to ride more. I still haven't mustered up the courage to take her on the highway, yet. I wear gear everywhere except for my legs (jeans only) and reading page 2 is enough to make me go buy some riding pants, today. Motorcycling, FTW. Wisconsin riding season, FTL. FWIW, I did not go on the highway for about 14-15 months after I started riding. I wanted to make sure I was very comfortable before I did that. Also, I started on a Ninja 250 and I did not feel comfortable being on the highway with that bike. It's not an issue on the bike I have now. Also, +1 on the riding pants. I went out and purchased the Icon Arc Mesh Overpants and I love them. I can wear shorts underneath, then just take the overpants off when I get to my destination. This way I'm protected when riding but comfortable when I am off the bike. Can you comment on the fitment of those pants? Did you buy a size or two up, or did you do as the disclaimer (below) says? **Note: These pants are sized to fit as overpants. If you wear a size 34 pant, buy a size 34 ARC Mesh Overpant if you intend to wear them over your jeans. If you plan on running commando, buy a size 32. ^ Actually I can b/c I have to return them. I'm typically a 31 or 32 waist depending on the fitment... and since i will be wearing them as overpants, I went with the 32 per that note. Turns out the 32 are way too long... so I am exchanging them for the size 30. I guess I'm a 31 more then a 32... so I should have gone with the 30 from the beginning. Now that I know they have an adjustable waist/connection system I know I can fit into them whereas I usually cannot wear a 30 with most "regular" pants. all the fluids where flushed, radiator cleaned out....some repair work on the fairings and a total repaint of the whole bike. the bike was painted Mercedes Mars Red. alls thats left is wet sanding and buffing out the light orange peal. going out on it the first time for this season, between school and work and trying to work on the bike i had no time and finally it's all done. as far as highway driving....there is more cars all around you, people around me drive like idiots and do not pay attention...people merging into you without noticing you at all. highways seem safer because there is no intersections however the amount of cars and speed can also get you in trouble. i much more rather be able to get a great feel of the bike around time at slower speeds then trying to bust down the highway at 75 and do a panic stop....not fun. Ever have a car pull a left turn in front of you on the highway?....I never have either.....but it's happened more times than I would like on city streets. Bike is more stable at higher speed....no cross traffic on the highway...more escape routes on the highway. Highway is by far a safer place to ride. First question back would be... when you were learning to drive, were you out on the highway almost immediately learning? Probably not... you likely learned to drive at lower speeds. Second question would be...are you a rider? I think you are, so surprised at the question. Other questions would be... have you ever been on a 400 pound motorcycle with other vehicles weighing anywhere from 2500 to tens of thousands of pounds maneuvering near and around you, within feet of you and your bike at 70-80 mph after only owning the bike for a short time, or only having a few hundred miles seat time? It can be safer, but it can also be much more dangerous. Higher speeds means any little mistake is amplified. You have to contend with idiot drivers at much higher speeds. Not to mention trucks. Ever been blown around in a car when an 18-wheeler blows by you at 80mph? Now imagine being on a motorcycle when that happens. Be prepared to hold on. Plus, at the higher speeds you have a much stronger wind hitting your body, which makes it harder to move your head to check for cars, etc. Just as with a car, the faster you go, the more "difficult" it is to drive. Except on a bike, going down at 35mph and going down at 75mph can mean the difference between being injured and being killed. Ever have a car pull a left turn in front of you on the highway? First question back would be... when you were learning to drive, were you out on the highway almost immediately learning? Probably not... you likely learned to drive at lower speeds. Second question would be...are you a rider? I think you are, so surprised at the question. Other questions would be... have you ever been on a 400 pound motorcycle with other vehicles weighing anywhere from 2500 to tens of thousands of pounds manuvering near and around you, within feet of you and your bike at 70-80 mph after only owning the bike for a short time? Plus, for me, I was not comfortable going on the highway with my 250. The RPMs at 75 mph would already be high and there was not much power left in the bike for me to accelerate out of trouble. On my 1000... I do not have to worry about that. I've been confident enough with my riding skills to go on a highway for a few months now... but was not confident with my bike until now. Ever have a 6500 pound SUV mommy-mobile with mommy on the cell phone merge into you almost into you at 75 mph? I haven't, but know friends who have. One went down due to a variety of factors (traffic conditions, overcompensated on brakes and locked them, etc). Luckily he was going slower before he went down, and he went down on grass... so injuries were minimal, but the bike was totaled. Woman didn't even stop... likely never even saw him. Been riding for many years. Seen my friends and myself go down too. Been in many close calls too. Perhaps it's California...but freeway/highway riding is the "norm". Over all my years and miles of riding I've had far fewer "close calls" on the highway versus the streets.....by a longshot. Now I'm not talking about spliting lanes on the freeway when traffic is pretty much at a dead stop.....that's an entirely different issue. Ever go into a corner on a canyon twisty and hit gravel....and before you know it you are watching your bike slide away from you while you are on your backside? I have.....the roadrash was fantastic! I stand by my opinion...as for the opinion of a lot of the guys & friends I have ridden with over the years: highway is much safer. I will say that the highway is Boooooooooooring! EDIT: ...and the stats IIRC are 70% of bike accidents are vehicle to vehicle.....majority occuring on city streets versus highway. Last edited by Moog-Type-S; 06-09-2009 at 06:39 PM.